Delux heavy duty fabrication table top includes drink and chip holders. Open table top size: 122 cm x 122 cm (4 ft x 4 ft). Top folds for storage . Strong black fabric carry case fitted with zipper and sturdy carry handles. Does not include chips and cards. Boxed-product Weight: Approx 8.0 Kg. Please don't confuse this product with the very inferior lightweight versions that split into 4 pieces, this is a very high quality poker table top. 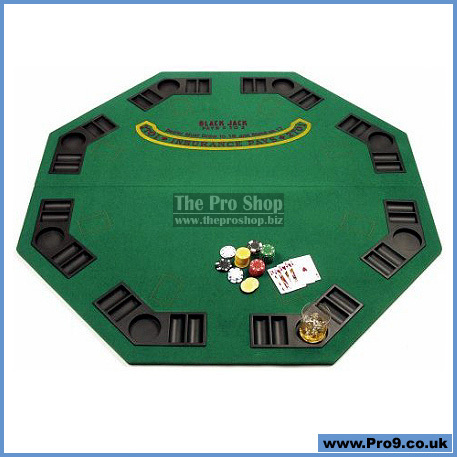 It is very heavy duty weighing in at 8 kilogrammes, and sturdily constructed in an octagonal shape, including individual drink and chip holders for each of the eight players. The table top folds into two pieces and comes complete with a luxury fabric carry case for easy transport and safe storage. Due to product's size/weight - free shipping only available in UK.